Sacramento State cashed in a costly eighth inning error by Arizona State and survived a ninth inning Sun Devil rally to notch the school’s first NCAA Tournament win. Following a booted double play ball with no outs in the bottom of the eighth, Sacramento State broke a 2-2 tie with a three-run rally. The Hornets nearly scored another run in the inning, but botched a squeeze play that nearly resulted in a brawl at home plate when the Arizona State catcher took a cleat to the leg. In the ninth, Arizona State responded with a pinch-hit two run homer and then placed the tying run on third with one out. But, the Sun Devils failed to score the tying run, and the Hornets escaped with a 5-4 win. “We believed that we would win today,” Hornets Head Coach Reggie Christiansen said after the game. Christiansen was so confident in his team’s chances that he did not even bother warming up Hornets closer Sutter McGloughlin with the game on the line. McGloughlin had a little tenderness in his shoulder, Christiansen said. In his place, Sacramento State reliever Alex Palsha picked up the win, weathering the ninth inning storm. Palsha surrendered a leadoff double followed by the pinch hit home run, which usual Sun Devil designated hitter RJ Ybarra belted over the left field wall. After allowing two different potential tying runners to reach third, Palsha struck out Sun Devil right fielder Trevor Allen on a 3-2 curve-ball to end the game. With the win, Sacramento staved off elimination and moved on to the Sunday afternoon game, in which the Hornets will face the loser of Saturday evening’s Cal Poly-Pepperdine game. The Hornets are now 1-1 in their first NCAA Tournament appearance. Arizona State’s season concluded with the loss Saturday. 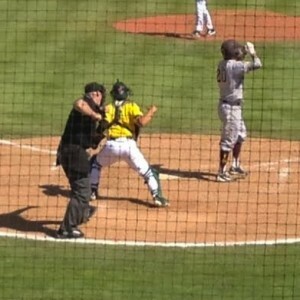 The Sun Devils, a perennial college baseball power, went 0-2 in the San Luis Obispo Regional.